All of the pieces made at Nourot Glass Studio are handcrafted in the ancient traditions of glassmaking. This type of glassmaking is called “free blown” because no molds are used so no two pieces are ever exactly alike after careful inspection only those of the finest quality are signed with the Nourot signature. 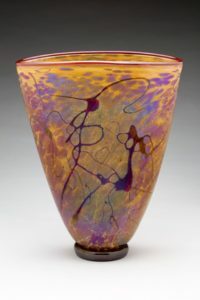 Nourot Glass is shown in museum shops and contemporary art galleries across the country as well as in Europe and the Orient. The works of Nourot are in the permanent collection of the Corning Museum of Glass, the Stuart Powell Museum, The Lannan Foundation, the Bergstrom-Mahler Museum, as well as many private collections.